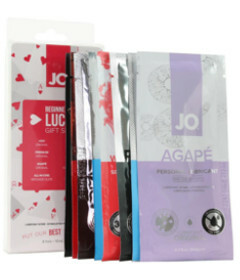 Give the gift of slippery, silky, beyond sensual smoothness with Jos Foil Gift Set. Perfect for lubricant newcomers and just as perfect for couples or solo players looking to explore different types of lube. 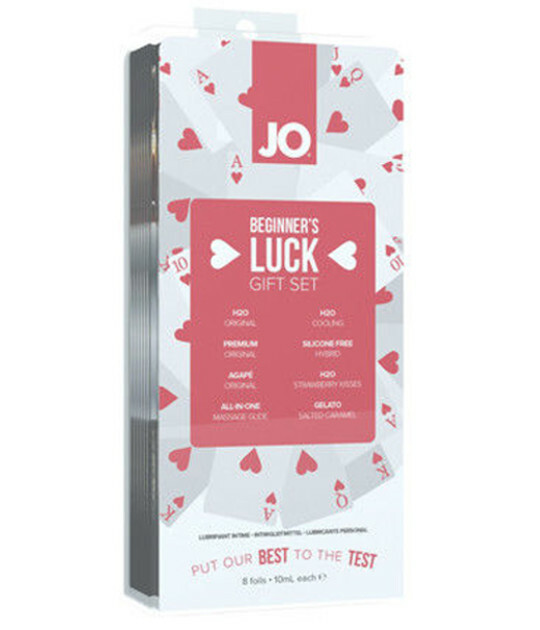 This eight piece sampler contains portable versions of some Jo faves H2O Original water based, Premium Original silicone, H2O Cooling water based, Agape water based, All-In-One silicone massage glide moisturizer, Silicone Free Hybrid water coconut oil based, H2O Strawberry Kisses flavored water based, & Gelato Salted Caramel water based. Wow!